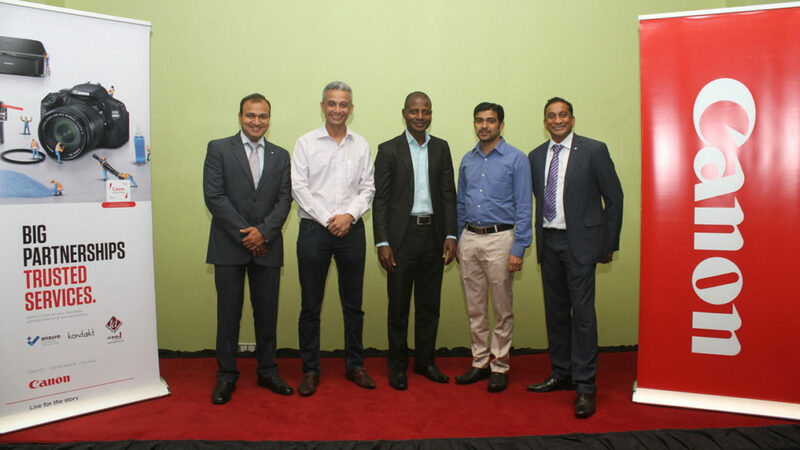 Canon Central and North Africa, a leader in imaging and business solutions, has partnered with three local service centres across three major cities in Nigeria to strengthen its in-country presence and drive its “closer to customer” strategy of optimal customer satisfaction. The partnership will leverage the local strength and expertise of Ensure Services, Kontakt and Technology Distribution (TD) to help create a unique business-to-consumer experience for customers. The Canon-authorized service centre initiative is designed to support the imaging community in Nigeria while creating access to repair and offer support for industry professionals, businesses and photography enthusiasts. Through the three authorized service partners, Canon will offer total after-sales product repair services in eight locations across Lagos, Abuja and Port Harcourt. The service centre will support all B2C products including DSC, DSLR, professional video, OPP inkjet- and Laser-printers, projectors and calculators under the Canon Central and North Africa warranty programme. The warranty programme is a specialized – first of a kind service, under Canon Central and North Africa (CCNA); a division within Canon Middle East FZ LLC (CME), a subsidiary of Canon Europe. Within the programme, Canon will offer customers an exclusive 3-year manufacturer warranty for Canon i-SENSYS Laser printers. Speaking on the partnership, Somesh Adukia, Sales & Marketing Director B2C, Canon Central and North Africa (CCNA) said: “The partnership was an important pillar in the brand’s ‘closer to the customer’ strategy which has been one of Canon’s key components for growth in Africa. “This is a really exciting time to be part of the imaging industry and we’re proud to be raising the bar throughout the market. This partnership clearly amplifies our commitment to bringing our customers closer to our industry-leading products while helping them to maintain the quality that encourages them to have fun with imaging through our ‘Big Partnership, Trusted Services’ motto,” commented Adukia. “Our setting up of a dedicated entity in Nigeria last year and the introduction of three specialized service providers is our commitment to providing the best possible services to our customers in Nigeria. We are also working towards establishing more collection points for our customers, in case they are located far away from the service locations,” he added. To communicate the launch of the service centres, Canon will also be launching a series of roadshows – consumer engagement activities and town storms across key locations. The roadshow will visit Ikeja City Mall, Computer Village Ikeja Lagos, Alliu Market Lagos, Aroloyo Market, Lagos GSM village Abuja, Bannex Plaza Abuja, Transamadi road Port Harcourt and Garrison Port Harcourt – from the 26th July to the 2nd August, 2017.